Life has gotten busy. And unfortunately this little blog suffers first. Work has picked up, with closings and new clients. The season truly has brought out the buyers and people are ready for fresh starts in new homes. Lucky me. And then there are the little people. I thought I was busy when they were babies, but toddlers require much more attention (I basically walk around with four arms wrapped around my two legs). And with nap time disappearing with one of them (in serious mourning), the days longer. SO, free time for writing, reading a magazine, and watching garbage has gotten harder. And I hate to say that plowing through a Vogue in my half hour of "quiet time" with a diet coke feels really great. 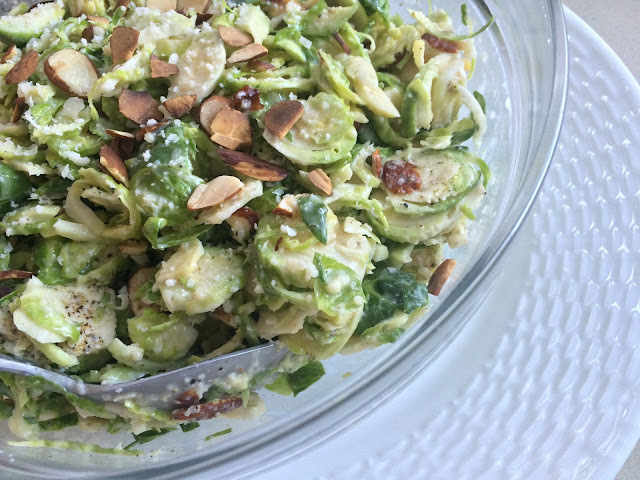 I have still been putting cooking on my priority list, so that gives me something to share with you besides great ways to entertain toddlers (combine this & this for hours of fun) and this salad is a real winner. Just a few ingredients with plenty of crunch and the perfect side for outdoor BBQs. Scatter almonds on a pan over medium heat on the stove. Toast, tossing every minute or so, until lightly toasted on all sides. Remove from heat and let almonds cool on a plate. In a small bowl, whisk together the mayo, mustard, honey, and vinegar. Add salt and pepper to taste and whisk in the oil slowly until combined. Taste and adjust for seasoning. In a large salad bowl, add the Brussels sprouts, almonds, and cheese. Dress with desired amount of vinaigrette (you may have more than you need, use on any other salad that week) and toss to coat.